I’ve had to have several conversations about SharePoint alerts recently. These conversations have revealed to me that many site owners don’t grasp that alerts are designed to be an “end-user empowerment tool” to facilitate self-service notification about SharePoint site activity. Alerts are not really intended to be an administrative tool for owners to “force” notifications onto site users or control how they work. Why is this so hard to understand? This misperception can cause problems if that concept is not fully embraced. SharePoint assumes and expects that users are able and capable of managing how they want to be notified, and will appreciate/use the tools allowing them to do so. Savvy site owners will realize there is little value in choosing not to leverage this behavior. Why take on that responsibility? Choose to use alerts as they are intended. Instead of laboring over administration and control of alerts, use that time and effort to educate users about alerts and how they can be one of the most powerful aspects of SharePoint. OOTB, site owners (or anyone with the Manage Alerts permission) can create and delete alerts on behalf of other users, but beyond that, alerts-for-others become the “responsibility” of the users for whom they were created. Included in that scope is the fact that at any time, any user is free to delete or change any alert put in place on his/her behalf, with zero awareness shared with the alert creator. Set up all the alerts you want, site owners; but just know that your users can delete them as fast as you can set them up. For example: Joe Owner creates an Announcements List alert that sends an immediate email to 5 users and himself when new items are added. After a couple of days, Joe decides that this is too many emails, and wants to change the alert from an immediate email to a daily digest. He finds that he can only modify HIS own relationship to the alert parameters. It is not possible to change/remove a “mass” alert in one action. When he updates his own instance of the alert, his changes are not “rolled out” to the other 5 users. They will continue to get the alert according to the original set-up. To stop the original alert, Joe would have to remove it manually for each individual (or ask them to it themselves), then recreate the alert with the new daily digest settings for those 5 users. See the potential administrative burden? Who wants that? A frequent question is: How do I see alerts on my site? 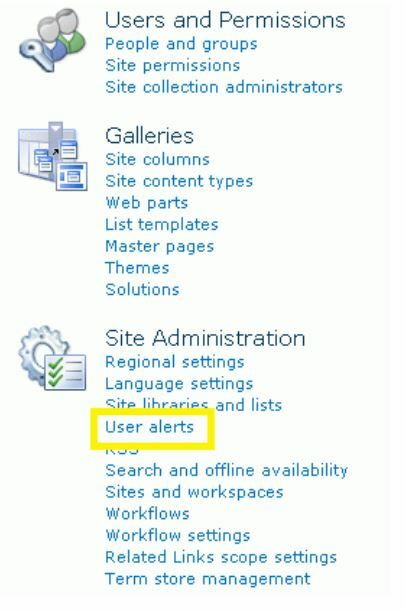 Go to Site Settings > Site Administration > User Alerts (see image). You will see a list of all alerts in place for that user. Mark the check box to select an alert and click “Delete selected alerts” to remove them. NOTE: It only works in this direction- there is no option to see all alerts and then the associated user name(s). 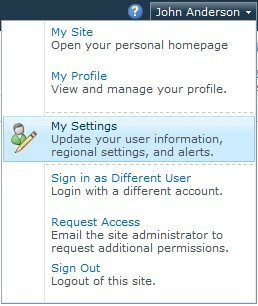 End Users: Locate your name in the upper right corner of the site and click the drop-down menu, then choose “My Settings” (see image). On the next page, locate and click the “My Alerts” link (top center, sort of small, above your user information). The next page displays all alerts associated with the user (self-created OR created by others). The user can then modify or delete any alert. Companies that want to expand the alert scope into a more admin-focused tool usually end up purchasing a 3rd party add-on, such as the one linked from this article. Also, developers can modify the alert framework by reprogamming default options. See this posting for some of those possibilities. This entry was posted in Best Practices, Education, SharePoint 2010, User Scenarios. Bookmark the permalink.